About nine months ago, Bill Bowers and I began what became a rather thorough study of signal splitters. From the beginning, we had hoped to develop a splitter design for homebrewing that would perform as well or better than the rather expensive units currently available on the commercial market. 1) Model MC-102, Stridsberg. The 2004 retail price was $65 plus S&H. 2) Model SP-1, RF Systems, available from several hobby sources around the world. Our test unit was purchased from Universal Radio. The retail price in 2004 was $89.95 plus S&H. 3) Model ZSC-2-2 Mini-Circuits. Our unit was purchased directly from the Mini-Circuit sales office in Missouri (phone: +1-718-934-4500) for $52.95 plus S&H in 2004. 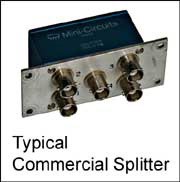 Those initial tests were widely published in May 2004 as An Evaluation of Commercially Available Signal Splitters. In brief, the findings were that all three units were quite adequate signal splitters and that - for all but the most demanding applications - we recommended selecting commercial units based on price and availability. We also noted that the Mini-Circuits Model ZSC-2-2 out-performed the other two units, at least slightly, in every single test. It was also the least expensive, at $52.95 for the two-port version. The data developed during those tests established the current state-of-the-art for the next design cycle. Those same results are presented in this article along with the test results for the new design that we suggest for DXers who wish to "roll their own" and save a good bit of "radio money" in the process. Why Do I Need a Signal Splitter, Anyway? In recent years, increasing numbers of radio hobbyists have wished to attach multiple receivers to the same antenna. This need may stem from a group wishing to share a single antenna on a DXpedition, or it may be from a single hobbyist wishing to operate two or more receivers simultaneously from the same antenna. In any case, many of us have found that simply using a stub of wire to hook the antenna ports of several receivers to the same antenna is an invitation to all sorts of problems. One of the funnier problems can occur if one of several receivers hooked together presents significantly lower impedance to the antenna than do the others. Years ago, when Mitch Sams, Kirk Allen and John Bryant first "shared" a beverage antenna, Kirk and John spent a frustrating half-night wondering why Mitch's old receiver was so much superior to their more modern gear: they eventually realized that Mitch's old receiver was literally sucking up all of their DX! A second common occurrence when hooking multiple receivers together is the fact that spurious radiations/local oscillator signals from one receiver can use the common antenna lead as a pathway to enter the other receivers; this can cause serious but difficult to recognize interference, strange "signals," etc. For all of these reasons and more, if you wish to operate two or more receivers - simultaneously - from one antenna, you will need to use a device called variously, an antenna splitter, a signal splitter or a power splitter: when referring to a receiving antenna device, most people use these three terms interchangeably. 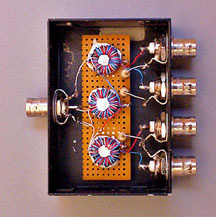 The first antenna splitters that many of us saw were rather expensive and complex devices built with vacuum tube technology. These devices were usually purchased as used-surplus from government surplus property outlets and often support 8 or 16 receivers simultaneously and contained sophisticated RF amplifiers, as well. In more recent times, smaller-scale splitters have become available commercially, intended for both the professional and serious hobbyist markets. The most commonly available splitters are 2-port, unamplified units. However, 4-port units, either with or without solid state amplifiers, are also available and two of the three splitter manufacturers produce a bewildering array of splitters suited for many professional communications uses. Military and intelligence agencies are known to have contracted with manufacturers to produce modern units with at least as many as many as 32 ports. These have recently appeared on the used-surplus market, as well. Most signal splitters are based on a fundamental building block which is a transformer-like device that accepts a single signal stream and splits it into two identical parts that are each (by the laws of physics) diminished in strength by about 3 dB, minimum. 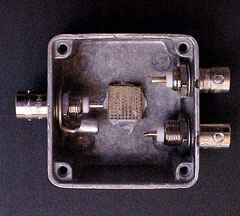 Usually, these transformer-like devices consist of a ferrite core with windings of fine wire; this building block may be diagrammed as an upside-down capital letter "Y." Antenna splitters that offer four output ports contain three "building blocks" arranged in a cascade fashion, where the first unit splits the signal into two halves, which are then fed into a second rank of two splitters; those second rank splitters divide the half signals into halves again, creating four identical signals of further diminished strength. Since each transformation/splitting incurs about 3 dB of loss, it is easy to see why most splitters of four output ports or more include RF amplification. 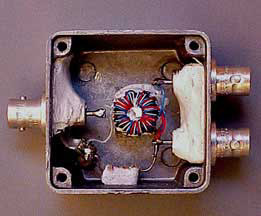 The so-called DH-P homebrew splitter first surfaced in an article the early 1980s by Down Under DX enthusiast Sam Dellitt. The article was first published in DX Australia and later reprinted in Canada's CIDX Messenger; a version of it was also featured in an article in the Proceedings of Fine Tuning (Proc. 1989, article F-12, p.5) by Nick Hall-Patch. The original core used by Sam has not been available for years and, in the Proceedings article, Nick suggested using the "binocular" core, BLN 73-202 by Amidon. This latter core is the one used in the tests shown later in this article. The wire is #30 or #32 varnished magnet wire which requires a bit of a delicate touch; unfortunately, larger wire sizes won't fit through the holes enough times to create the proper turns count for this design. As you will note in the test results presented later, John Bryant's twenty year-old DH-P splitter, a veteran of numerous DXpeditions, performed surprisingly well. In fact, it out-performed both the RF Systems and Stridsberg units at most frequencies! The performance of the DH-P splitter formed the base line for Bill's design development and testing cycles. He hoped to be able to out-do the older homebrew and approach the outstanding performance of the Mini-Circuits splitter. Both Bill and I tend to favor winding cores that are about 1" in diameter or more. The ease of winding these larger cores more than offsets the small additional cost. However, after several series of design/testing, Bill was rather surprised to find that, for this application, smaller cores were clearly superior! From that point, Bill focused on designing a splitter based on Amidon's FT-50J, a toroidal core of about ½" outside and ¼" inside diameters. Several additional design/testing cycles lead Bill to a winding pattern and turns count quite similar to the DH-P homebrew splitter. The winding design that Bill suggests is a 21 turn "primary" from the antenna side of things. That winding is to be laid on the core first in an evenly distributed pattern around the circumference of the toroid. The secondary coil is 14 bi-filar turns, also distributed evenly around the toroid (imagine a twisted pair of one red and one blue wire.) 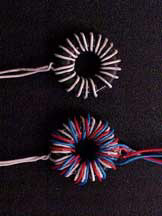 From the two ends, one red and the opposite blue are tied together and grounded through a 27 Ohm resistor. You have just created a 28-turn secondary with a center tap to ground through the resistor. The remaining red and blue wire go, one each to the center conductor of the two output ports. Please be sure to follow the wiring diagram with particular care: John managed to connect the wrong red and blue wires together on four-out-of-four of the first prototype splitter series! 1) Count as a turn each time the wire goes through the hole. 2) It is often handy to secure each layer of winding with "super" glue. 3) Use about one twist per inch for the bifilar winding. Total length of each winding: about 20." Note also that John has glued a small piece of Bakelite (1/2"x1/2"x1/4") on the bottom of the Hammond box to serve as a insulating mounting platform for the wound core (see end note 1). The white substance on the interior of the right-hand box is an epoxy paste made by Protective Coating Company of Allentown, PA, USA. The white version is marketed as "PC-11" while a dark gray version is sold as "PC-7." (Google: PC-7 epoxy) John now applies this to the backside of most chassis mounts to stabilize them permanently. Unlike "super" glue and numerous other fixes, neither PC-7 nor PC-11 have ever failed in the field. It is possible, of course, to fabricate four-port splitters using somewhat larger Hammond boxes. However, it is often possible to find new or slightly used four-port splitters intended for VHF bands, but utilizing standard BNC connectors. Such was the case with the box and ports on the left. John obtained five of these beauties new for just over $5.00 each through an on-line auction: less than the cost of the BNC connectors alone. The three transformers are mounted to perf board and, in turn the perf board is mounted to ¼" stand-offs with PC-11 epoxy paste. The resistors for each of the splitters may be seen end-on, directly to the right of each core. Total cost for this particular 4-port splitter was under $10.00, a 80 to 90% savings of "radio money." Rolling your own splitters is all well and good, but our real concern, of course, is distributing precious DX signals equally to two or four receivers with as little loss and as little coupling from one receiver to another as possible. The only way to clearly determine our success or failure in this effort was to run a series of comparative bench tests exactly as we had done in our previous article on commercial splitters. The test equipment used was: HP-4192A, LF Impedance Analyzer; HP-11048C, Thru-put 50 Ohm terminator; AG-04192-61001, Power splitter-50 Ohm; and Fluke-8505A RF multimeter. The test voltage was 0.10Volt RMS. The test instrumentation covered the frequency ranges, 150 kHz to 13 MHz, so our 11 test points fell within that range. We believe that it is safe to extrapolate the results up to 15 or 20 MHz to cover most of the bands of interest to our readers. The following characteristics were measured over a range of frequencies from 150 kHz to 13 MHz: Antenna Impedance Match, Receiver Impedance Match, Signal Isolation, Impedance Isolation and Signal Attenuation. The test data from our previous article on commercial splitters are included for comparison purposes. The two "proof of design" splitters that were bench tested here are the two shown previously in this article. ANTENNA IMPEDANCE MATCH (see end note 2): This is the impedance that will terminate the coax lead-in cable from the antenna. The RG-58 has a characteristic impedance of approximately 50 Ohms and if the antenna port of the splitter has an impedance other than 50 Ohms, part of the signal will be reflected back to the antenna. The greater the impedance of the antenna port differs from 50 Ohms, the greater will be the signal loss. The amount of loss is rather complex and the total loss also depends on the length and attenuation of the coax. This impedance was measured at the antenna port with all receiver ports terminated in 50 Ohms, resistive. The ideal splitter would present 50 Ohms at the antenna port. RECEIVER IMPEDANCE MATCH: This impedance, in an ideal splitter, should also be 50 Ohms to match the 50 Ohm impedance of the receiver antenna terminal. The mismatch here is not quite as important as there is usually a very short cable between the splitter and the receiver. Further, The 50 Ohm input impedance of the receiver is often fairly well defined over a certain bandwidth. This measurement was made at a receiver port when the other receiver port and the antenna port terminated in 50 Ohms, resistive. SIGNAL ISOLATION: The local oscillator of a receiver radiates back out the antenna connection and thus into the splitter. To prevent one receiver's oscillator from interfering with the signal going into the other receiver connected to the splitter, it is desirable to have as much signal isolation as possible. The larger the signal isolation, the better. For this test, the attenuation, from a 50 Ohm source connected to a receiver port, was measured at another receiver port. All receiver ports and the antenna port were terminated in 50 Ohms, resistive. IMPEDANCE ISOLATION: The antenna input impedance of a receiver with a "coax connection" is nominally 50 Ohms when it is tuned to the incoming signal. Some receivers show an impedance as low as 10 Ohms at frequencies other than the one to which the receiver is tuned. This 10 Ohm load at one receiver port of the splitter can upset the impedance seen at the other port. Here again the ideal splitter would continue to present 50 Ohms impedance even when the other port is loaded with 10 Ohms. This measurement was made at one receiver port as the impedance at one of the other receiver ports was reduced from 50 to 10 Ohms, resistive. We were gratified with the test results. First, considering Impedance Matching to both the antenna and the receiver, below 5 MHz the BB-2, the BB-4 and the DHP-2 performed considerably better than the Stridsberg and RF Systems units. The new BB homebrew design was somewhat better than the older DHP unit and even out-performed the Mini-Circuits unit at some frequencies. The same general results were obtained when testing for Isolation: both homebrew designs substantially out-performed the Stridsberg and RF Systems splitters and the new BB designs actually outperformed the really excellent Mini-Circuits design, in a number of instances. Finally, in the important Signal Attenuation test, the homebrew units proved superior to the commercial units in many instances. Although all three commercial units out-performed the homebrew units as the test frequency climbed above 5 MHz, the differences in both Isolation and Signal Attenuation, even at 13 MHz amounted to a worst-case of 2.3 dB for the DHP design, .13 dB for the BB-2 and less than a full dB for the BB-4. Almost certainly, the performance of these units could be improved in several ways. It is possible that both Isolation and Attenuation could be improved by using slightly larger boxes. This is particularly true in the case of the BB-4. The VHF splitters used very small cores and thus the boxes that John obtained so cheaply were less than .75 inch deep. These small tolerances between the larger FT-50 cores and the box may have caused some capacitive coupling. The tight quarters also prevented John from arranging the three cores at 90 degrees from each other as is standard practice. It would be better to arrange the BB-4 cores at 90 degrees ( O __ l as viewed from above .) Our design goal was to create a homebrew unit that would perform at LW, MW and SW frequencies. If our goal was to only serve the shortwave frequencies - 3 to 30 MHz - a different core material might have improved performance above 5 MHz. As we noted in the article on commercial splitters, we were both surprised at the impedance characteristics exhibited by both the Stridsberg MC-102 and RF Systems SP-1 in the tests of Antenna Impedance Match, Receiver Impedance Match and Impedance Isolation. In some cases, these mismatches reached 100%. However, the measured signal losses of all five 2-port units and the two 4-port splitters are very nearly equal, reminding us again how forgiving receiving-only devices are of mismatches.
. its fun rolling your own! To measure the insertion loss of the splitter, the oscillator output of the HP-4192A LF Impedance Analyzer was fed into a power splitter that split the signal two equal parts. One of the resulting signals passes through a 50 Ohm feedthrough and goes directly to Channel A. The other signal goes to the antenna terminal of the splitter under test and the signal from a receiver output terminal goes through a 50 ohm feed-through to Channel B of the HP-4192A. The HP-4192A compares the signals from A and B and calculates and displays the signal loss resulting from the signal passing through the splitter. 1) Although the enclosure for the two-port unit was aluminum and magnetically neutral, there is still some possibility of capacitive coupling between the windings and the enclosure at higher frequencies, so an insulating block/mounting pedestal is a reasonable idea. The enclosures for the four-port units that John built were heavy-gage sheet steel and, therefore, even more likely to cause some degradation of performance were the cores not separated from the enclosure with an insulating block. It is interesting to note that Mini-Circuits is very careful to isolate the cores from their aluminum enclosures and to arrange them in an arrangement that generates the least interaction between them: at 90 degrees (O __ l as viewed from above.) They also maintained the shortest possible leads from component-to-component by placing all ports on a single surface of the enclosure and mounting the printed circuit board directly to the rear ends of the chassis-mount BNC ports. Each of these design decisions could contribute to the outstanding and relatively broad-banded performance of the Mini-Circuits splitters. 2) The measured values of Z were actually complex, not purely resistive. The impedance phase angles were, however, very small in most cases, and we feel that including those angles would have been more confusing than helpful. For instance, the largest impedance phase angle for the Mini-Circuit ZSC-2-2 was less than 2 degrees over the entire frequency range. For all practical purposes, the tabulated values of Z can be considered resistive.